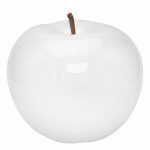 THE GLAZED EVE APPLE IS A STRIKING SCULPTURAL ELEMENT INDOORS OR OUT. AVAILABLE IN MULTIPLE COLOR AND SIZE OPTIONS, EVE IS HANDCRAFTED OF CLAY AND ORGANIC PIGMENTS. MAY BE USED OUTDOORS IN TEMPERATURES ABOVE 32 DEGREES FAHRENHEIT.